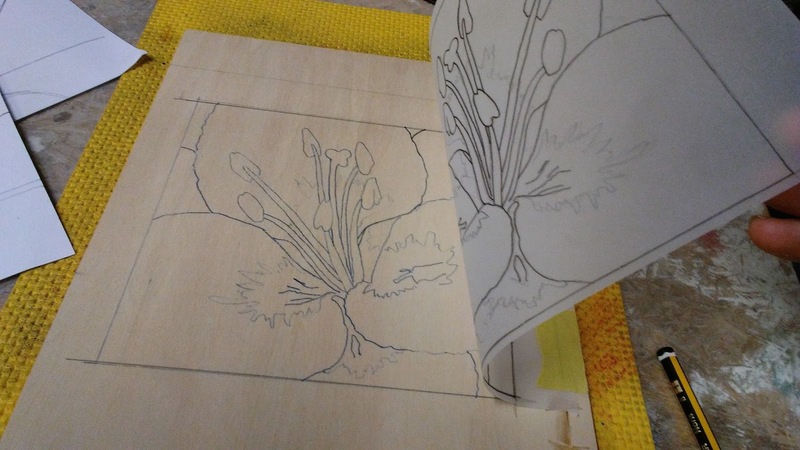 I've been meaning to do this for almost as long as I've been making woodblock prints. 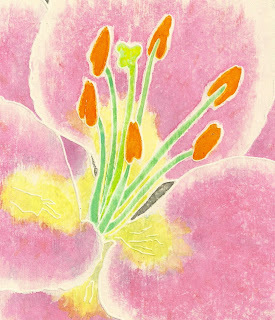 Mokuhanga prints usually are made with transparent colors and the nature of printing from an imperfect surface (wood grain) onto another imperfect surface (paper fibers) with a handheld device (a baren) that allows a great deal of variability in the pressure obtained means that the final result is often not fully predictable. I do know that whenever to color layers are printed--either the same or different colors, the result is almost always both denser and richer than that you can obtain by just increasing the pigment or mixing the colors in just one pass or impression. 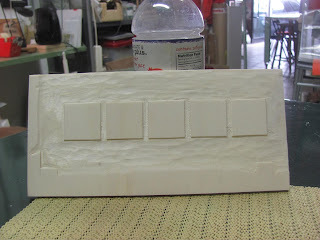 Here are a few test strips made with a fairly simple model. 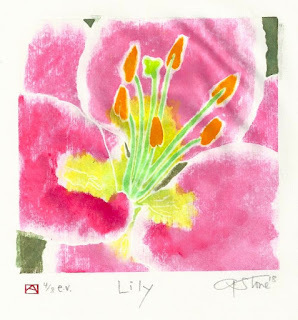 There's a single block with 5 squares and the block is printed with a color mixture made up of 50% pigment (from tube watercolors) and 50% rice paste. The entire block is printed once, and then with each following impression one less square is printed. The end result is 5 separate squares each printed with the same color mixture but with a varying number of impressions. The first block was printed only once, the second twice, the third three times, etc. The results show the buildup of pigment and overall tonal strength obtained by multiple impressions. I could have gotten a much lighter 1st square by using even more dilute pigment and I could have gotten a much darker final square by adding additional pigment each time to increase the pigment load above 50%. The next step is to do a color grid, showing the effects of overlapping the primary colors to obtain secondary and tertiary colors. 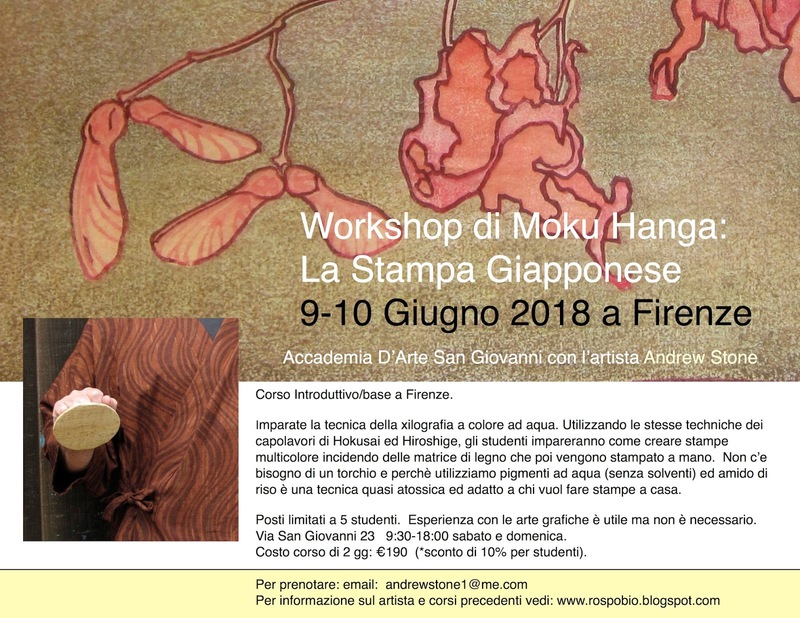 MokuHanga a Firenze--June 9-10: Upcoming workshops. 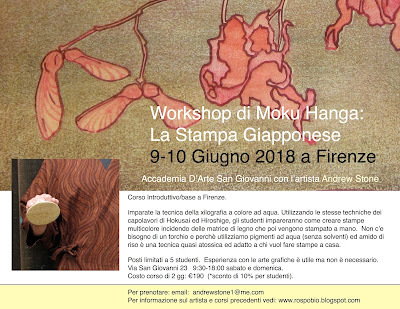 My next small-group beginners' workshop for Japanese woodblock will be next month in Florence. June 9-10, from 9:30am-6pm. This class is targeted to Italian speakers but I'll be hosting another class later this summer specifically for English speakers if there is enough interest. 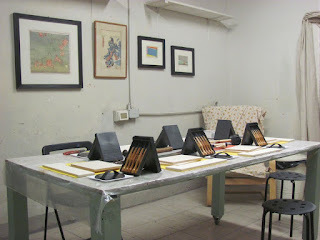 And remember, private classes for 1-2 people in English or Italian are possible and can be tailored to fit students goals and schedules and are suited to beginners who want to get a jump on the technique through one-on-one instruction as well as for advanced students (linoleum or oil-based) who want to to learn the Japanese method of printing but already have a good sense of carving techniques. I'll post additional dates and venues as they become available. I wanted to have another go at a white line or Provincetown print. (I've done a couple already--my "Tree Farm at Night" from 2016, last year's Baren exchange print, "Apostrophetic", and my afternoon experiment from last summer, "Sweet Tea". I was very happy with how "Apostrophetic turned out, but wanted to try a simpler print to see if I can work on a version of this method that works for me. It's an odd technique--using just one block and allows for lots of freedom for color application but as one print is produced at a time, it's more suitable for unique prints or very short runs. Here is the one block after I transferred the image but before it was cut. This was a simple image, close-cropped to both allow the shapes to be bigger and easier to brush in with pigment and to allow for a little drama. While a traditional white line is made by tacking the paper to the block, folding it back, and applying the color with a brush to a small area, flipping back the paper and printing that section and repeating this for each area and multiple times to build up stronger and more uniform color. I've approached it more as a variant of traditional mokuhanga using dampened Japanese paper and a kento system of registration to set the paper down each time in the right spot. Here's the first 4 prints I made from this block. Number 1/8 on Okawara handmade-- a paper that I got originally from Hiromi paper in LA--but I've added additional dosa (sizing) to make it work for water based prints. This is a Thai kozo-blend paper that is a little off white in color. Encouraged I tried 3 more copies on different kinds of paper. 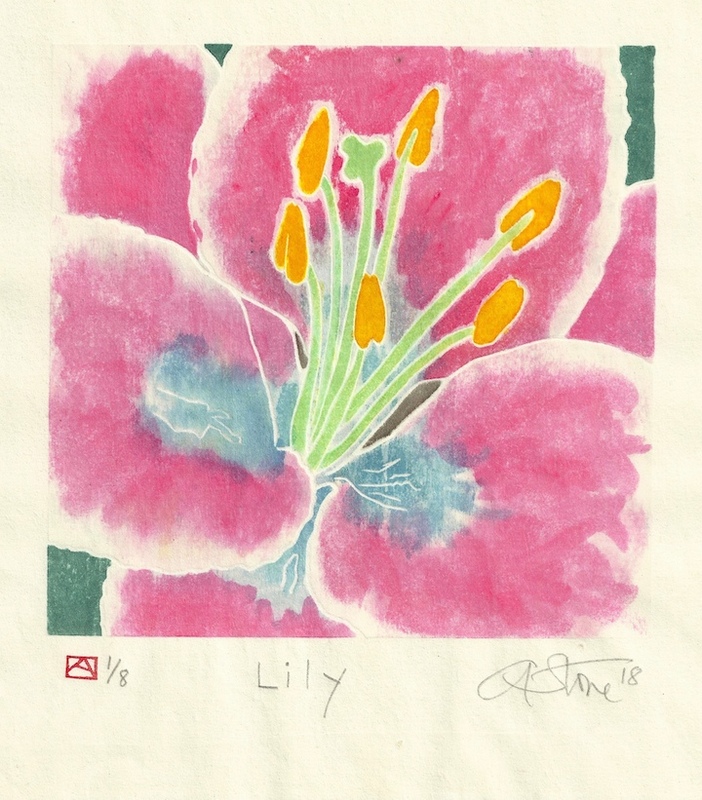 These 3 all look different but this is due more to the different papers than changes in colors as these were each printed using the same pigments and similar color applications. The differing weights and fibers made for very different prints. These three copies were all built up or printed semi-simultaneously. A few color layers on one, then I'd switch to a new sheet and built up the colors by adding pigment multiple times to each area. There are at least 15 color applications to each of these prints. #2/8 is on a very heavy, uneven-surface Fabriano watercolor paper. It was fairly heavily sized and was very difficult to print with a baren and only a little easier with a small doorknob. The "moth eaten" appearance is due to the uneven surface and lack of adequate pressure. No. 3/8 is on Gampi Torinoko, a beautiful handmade gampi paper no longer made but once available from McClains. This paper also has added size/dosa. Detail of the copy on Gampi Torinoko, #3/8. It's a natural color paper and really lovely. It accentuated the embossing of the white lines and has a softer feel to the colors. 4/8, above, is on Hosho Professional, another paper from Awagami--(100% cellulose but with added sizing). 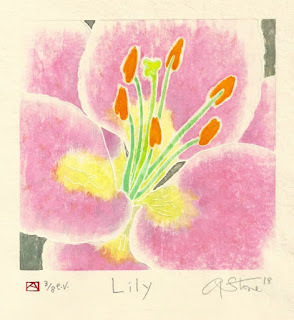 This one was done more loosely and with wetter pigment to better approximate a watercolor painting. Unfortunately, the paper slipped during one color application (See the dark background parts for double printing) and there was a section that got muddied up by too many color layers so this is probably a reject. I'll have another try before I retire this block. 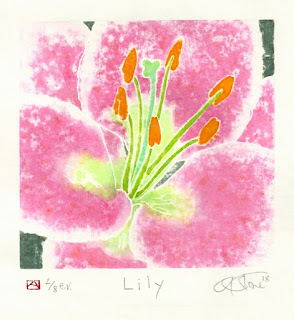 I want to try printing on DRY paper--using the traditional method--and also on unsized paper. Arches cover is supposed to be good, but I'll use one of my unsized or weakly sized Japanese papers to see how they print with this method.